Before getting to the Final Morality Theory of Everything, or "How to Live Like a Blissful Yogi In a Cave", we have to cover two more stepping stones. 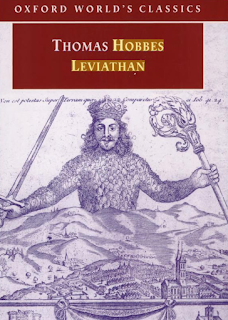 Thomas Hobbe's was a guy who decided that in the good old days, before we became civilized, things really weren't so good. We constantly had to fight off animals, bad breath, stinky clothes, and life was "nasty, brutish, and short." (I am very happy I live in 2011 every time I imagine a caveman having to endure the flavor of kissing his cave-woman.) Thank God one day we put down our spears, got together and decided to hoe-down in a village. In order to live in society, though, we had to put some basic rules in place. For instance, it wouldn't be good for people to go around murdering each other because then you'd spend your whole day looking over your shoulder with a gun instead of wasting time on Facebook. And it would have to be bad to lie, because otherwise how could you do any business? You wouldn't be able to trust anyone. 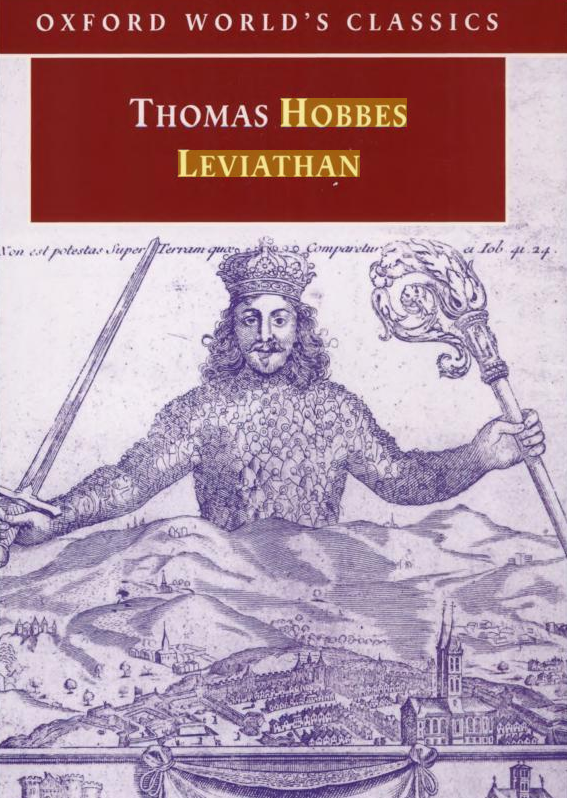 In this manner, Hobbes devises a whole set of reasonable rules that any society must have in order to survive. The concept was called a Social Contract. This idea gave people a set of ethical rules that allowed them to live happy productive lives. Thus, civilization was necessary in order for conditions to arise where people can afford to act morally. There is another way to arrive at the idea of a Social Contract. Imagine you lived in Nazi Germany and you and your friend were imprisoned in different cells. You have done nothing wrong, heck, you aren't even Jewish. But you are told to confess anyway. Maybe they caught you lip-syncing Britney Spears newest "song" on Youtube. 1) If you confess, and your friend does not, you only get 1 year in prison, and your friend gets 10. 2) If neither of you confess, you both get 2 years. 3) If you and your friend both confess, you each get 5 years. 4) If you do not confess, and your friend does, you get 10 years and he gets 1. Try to guess the correct response. You must confess. If you confess, no matter what your friend does you are better off. Suppose he confesses. If you do not confess, you get the full 10 years. If you confess, you only get 5. Therefore its better to confess. Now suppose he does not confess. If you confess you get 1 year, but if don't you will get 2. So its still better to confess. Now obviously, the best for both of you, taken as a whole, is for both of you to not confess. But you can't communicate with each other, therefore, you have to do what you think is best for yourself. This illustrates an important point. If you could communicate with your friend, you could establish a rule that both of you will not confess. This ends up bringing the optimum result. But, this rule has to be enforced somehow, otherwise one or the other could renege. And this is exactly the condition that we face in society. 1) You would be best off if you could ignore everyone else's wishes while everyone else treated you with respect. This is called a "Free-rider." I also call this the "Bailey" in honor of a good friend. 3) A bad situation would be if everyone was selfish, this is what Hobbes called the state of nature. Or LA. 4) The worst situation is if you treat everyone nicely while they walk all over you. Rachels calls this person a "sucker". MC Hammer comes to mind. Obviously, if we adopt a rule where everyone is selfish we are worse off than if everyone treated each other nicely. It would be nice to be a Free-Rider but noone else would agree to that rule, it would not be adopted as law. Therefore, we collectively bargain our way to the second choice. 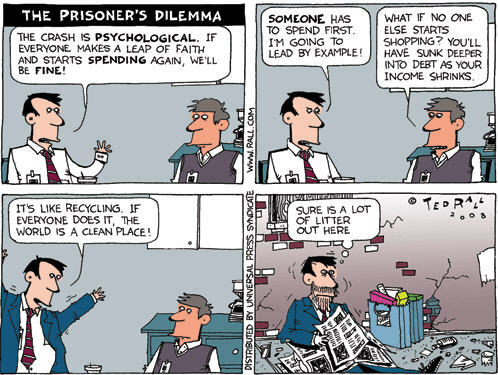 This is another way of thinking about the Social Contract. The Social Contract has limits though. Suppose one is asked to give up his life in order to save 5 others. The rules of a society might require this. But, one can argue that the only reason a person enters into a social contract is that they derive benefit from it. Once the contract endangers their life, they can remove themselves from the contract and escape back to "the state of nature." Thus, we give up some freedoms when we enter society, but there is limit on the amount of self-sacrifice is required. We can always quit civilization and move to Berkeley, California. What does this mean for civil disobedience? 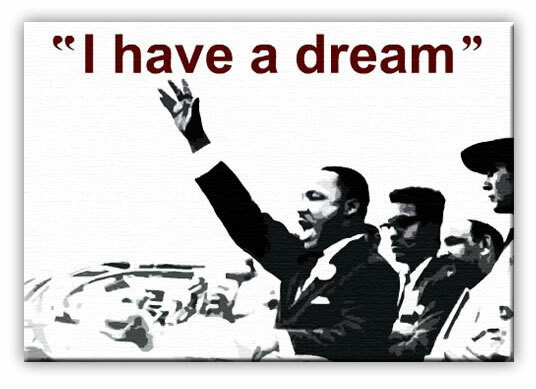 When Martin Luther King Jr. protested the treatment of blacks, many sympathized but some nevertheless found that the law is the law, and must be respected above anything else. Rachels argues that for blacks, the social contract did not provide them any benefit. In fact, society's rules made their life more miserable. Therefore, African Americans were not bound by the laws of the society and they had firm moral ground for their protests. The biggest problem with Social Contract Theory is that it leaves no room for those who are physically unable to abide by the laws. Some people may have mental illness or brain abnormalities. The rules of society have been written such they assume a person is capable of following the rules and deriving all the benefits of doing so. But for these individuals, they may not be capable of following the rules. Morality seems to indicate that these people should still be offered protection from murder, should not be lied to, and provided the necessary resources to live as well as they can. In other words, it seems to be the right thing to do to help them even if they can't abide by the contract. Thus, there is a serious problem with the whole theory. Indigenous peoples seem to have a profound respect for each other and their environment that seems to be lacking today. It is not necessary to live in a city in order to live a good, ethical life. Perhaps the closer one gets back to the "state of nature," the more clearly one can see what is truly good and valuable in life. 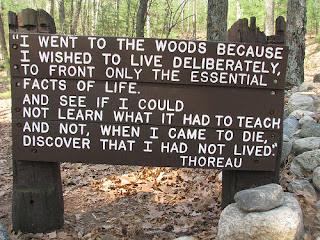 Thoreau, for instance, did his greatest work after he became a hippie on Walden Pond. In ancient Greece, Socrates, Plato, and finally Aristotle asked the following question: "What makes a person good?" 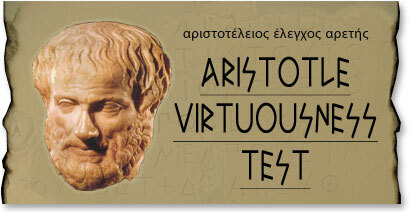 Aristotle's answer was a set of Virtues, such as courage, honesty, ability to finger-paint, and above all: loyalty. But when the middle age theologians gained power this view was forgotten, because God was a law-giver and what was important and good was simply obedience to the Law. After the Rennaissance, the divine viewpoint was abandoned but instead of returning to Greek thought, philosophers instead asked, "What is the Right Way to Live?" This is a very different question than "What makes a person good?" The Enlightenment thinkers came up theories of rules that implied duty and obligation. In other words, they tried to bore you to death until you said "Ok Ok! I'll do it!" Suppose you are sick in the hospital. Your friend comes to visit, and you are overjoyed. But after talking for awhile, you realize that the only reason he came was that he felt it was his duty. He didn't come because he really wanted to. 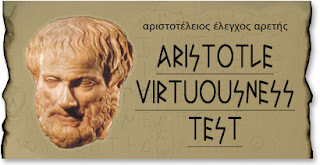 Take the Virtue Test! Really! Aristotle's Virtues are an answer to this problem of moral motivation, and I have to say I love it. One of the biggest problems I have with all of these damn theories is that I feel like I am being told what to do. But with Aristotle, that wasn't a problem at all. A virtuous man enjoys being virtuous, because he knows its the only way to be truly happy. Virtue is an end in itself. I can't help but notice the parallels between this and Buddhist thought. The Dalai Lama teaches that the only way to be truly content with your life is cultivate the virtues of empathy and compassion, which leads to selfless behavior. Although the focus shifts a bit from loyalty to empathy, the end result is the same. By living as a good person, one becomes happy. The Final Theory of Everything. Really! We ought to act so as to promote impartially the interests of everyone alike (Utilitarianism), except when individuals deserve particular responses as a result of their own past behavior (Kantian retribution). Not bad. I can dig it. Here's the problem. We have to stop trying to come up with such a simple formulation that it leaves out important things. Morality isn't physics, and trying to come up with something concise like E=mc^2 just isn't going to happen. For instance, Rachels statement doesn't incorporate the moral motivation benefits of Aristotle's Virtues, and it doesn't take into account the problems with Utilitarianism such as protection of human rights when the needs of the many conflict with the needs of the few. So I think in the end trying to come up with a single statement like that is a load of garbage. But I did learn a few things about all of this. 1) Don't rely solely on God for the answers. He is believed by Jews, Christians, Muslims, and Hindus, and they all think He says something a little different. We are all the same, but we can't all be right. So its best to use the greatest gift you have, Reason, to think a little more deeply about what is really right and wrong on your own. For instance, my reason is telling me that I need a 3rd can of Pringles right now. 2) Be careful about applying absolute rules to a situation. You have to consider circumstances, and that's why we use juries and not computers to determine guilt or innocence. 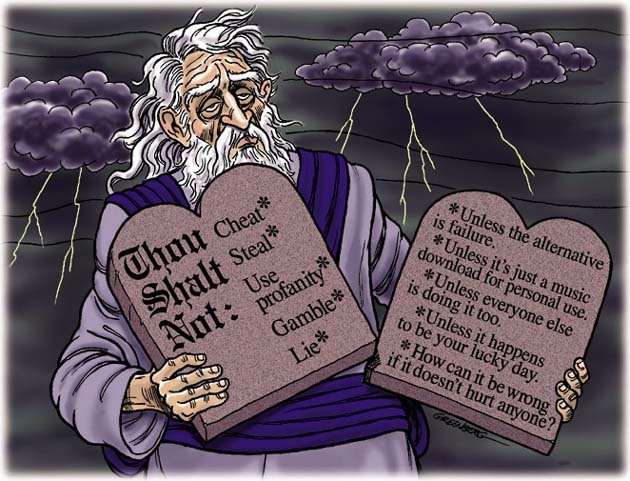 3) The best rule, if you have to have one, is the Golden Rule. Do unto others, and before you do something ask yourself if you would want someone else to do the same thing in your situation. In the end, its all just about integrity, which Aristotle would call a Virtue. 4) Don't do the right thing out of some bland sense of duty or obligation. Do it because you recognize its the only way to truly be happy and content with your own life. And remember, if Electricity comes from Electrons, then Morality comes from Morons.